University of Cincinnati physicists have joined forces in a major international collaboration to shed new light on one of the most pressing questions in particle physics — "do sterile neutrinos exist?" After looking at how the three known neutrino types behave and interact — classified as electron, muon and tau 'flavors' — a new research collaboration between the U.S.-based MINOS accelerator neutrino experiment and China's Daya Bay reactor neutrino experiment has looked for an elusive new light sterile neutrino that may resolve some outstanding puzzles in astrophysics and cosmology. "Neutrinos are almost nothing at all, as they have almost no mass and no electric charge, but these itty-bitty ghost particles that can travel at near light speeds are all around us, from those created at the Big Bang to those originating in nuclear fusion at the center of the sun – the same process that produces sunlight," says Alexandre B. Sousa, University of Cincinnati assistant professor of physics and part of the MINOS experiment. "And they play an essential role in our fundamental understanding of how the universe works." Back in the 1990s, scientists working on the Liquid Scintillator Neutrino Detector (LSND) experiment at Los Alamos announced evidence of muon neutrinos oscillating into electron neutrinos. However, the oscillation was occurring much faster than the neutrino oscillations discovered by the Super-Kamiokande experiment that led to the 2015 Nobel Prize in Physics. According to the researchers, if the LSND results are correct and due to neutrino oscillations, the most likely explanation is the existence of a new, fourth type of neutrino. But this new neutrino would have to be much stranger than anything seen before, being sterile, meaning that it does not interact with matter except through gravity. Over the last twenty years, a number of experiments have tried to confirm or refute the LSND findings, but Sousa says the results have been inconclusive. The new results released by the MINOS and Daya Bay experiments strongly suggest that the ghost-like sterile neutrinos do not explain the LSND result after all. The findings of these studies, which include physicists from the University of Cincinnati, are now published in the journal Physical Review Letters, titled, "Limits on Active to Sterile Neutrino Oscillations from Disappearance Searches in the MINOS, Daya Bay and Bugey-3 Experiments." Since the LSND experiment saw muon-type antineutrinos turning into electron-type antineutrinos, scientists must look at both types of neutrinos simultaneously to address the LSND observations — this is where Sousa says the collaboration between Daya Bay and MINOS comes in. The MINOS experiment uses an intense beam of muon neutrinos that travels 735 km from the Fermi National Accelerator Laboratory in Chicago to the Soudan Underground Laboratory in northern Minnesota. MINOS has made world-leading measurements of neutrino oscillation parameters by studying how these neutrinos disappear as they travel between the two detectors. The existence of a sterile neutrino could cause some of these muon neutrinos to disappear at a faster rate than one would expect if sterile neutrinos do not exist. So far scientists working on the MINOS experiment have shown that this does not happen. The Daya Bay experiment looks at electron antineutrinos coming from a nuclear power plant in the Guangdong province of China. Daya Bay observed that some of these antineutrinos disappear and measured for the first time one of the parameters governing neutrino oscillations, for which they earned the 2016 Breakthrough Prize in Fundamental Physics. A sterile neutrino would affect the rate at which these electron antineutrinos disappear, but the Daya Bay scientists have also seen no evidence for this. These two separate results from MINOS and Daya Bay, on their own, are not enough to address the puzzle that LSND set out almost twenty years ago. "Neither the MINOS nor Daya Bay disappearance results alone can be compared to the LSND appearance measurements," says En-Chuan Huang of Los Alamos Laboratory and the University of Illinois at Urbana-Champaign, one of the scientists working on the Daya Bay experiment. "Looking at multiple types of neutrinos together, however, gives us a much stronger handle on sterile neutrinos." In spite of the results, the researchers say they have significantly shrunk the hiding space for this light sterile neutrino. "It's not common for two major neutrino experiments to work together this closely," says Adam Aurisano, postdoctoral fellow with the University of Cincinnati Department of Physics and the lead MINOS scientist who worked on the result. "But to really make a statement about the LSND evidence for sterile neutrinos, we must take Daya Bay's electron-antineutrino data and the MINOS muon-neutrino data and put them both together into a single analysis." It is the combination of these two results, the MINOS experiment probing the conversion of muon neutrinos to sterile neutrinos and the Daya Bay experiment testing the conversion from electron antineutrinos into sterile neutrinos that researchers say has significantly shrunk the hiding space for this light sterile neutrino. This will also help other search efforts for knowing where to look for these elusive particles. Moreover, the researchers — including Jacob Todd, UC physics doctoral student who is the lead analyst in searches for sterile neutrinos with MINOS+ — anticipate an even more sensitive search for sterile neutrinos. 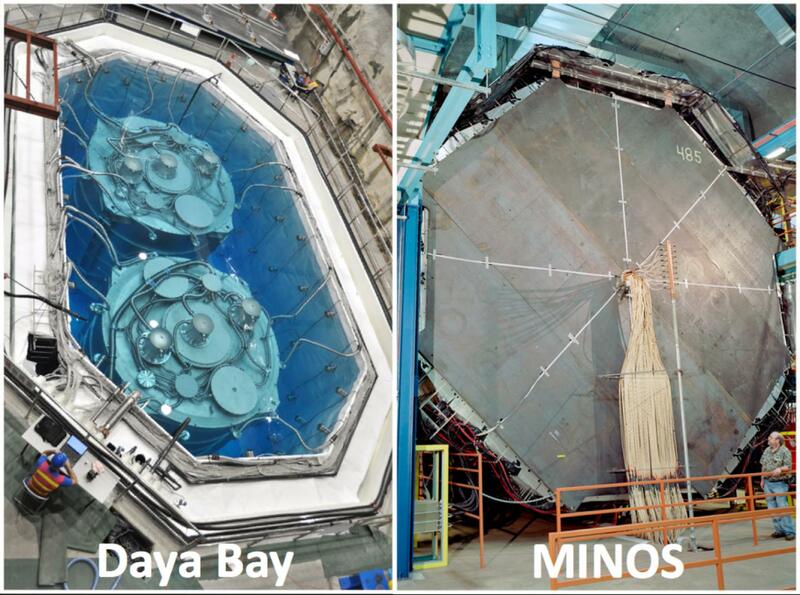 New data from the MINOS+ experiment (which uses a higher energy beam than MINOS) will be combined with four times more data from Daya Bay in a forthcoming joint analysis to be carried out over the next year. "The neutrino is one of the most enigmatic particles we have encountered," says Aurisano. "And as history suggests, surprises may await us."